I did not find a lot of examples on the Internet because it is usually not recommended to play with this function, but I think the use-case I'm about to show you is interesting. 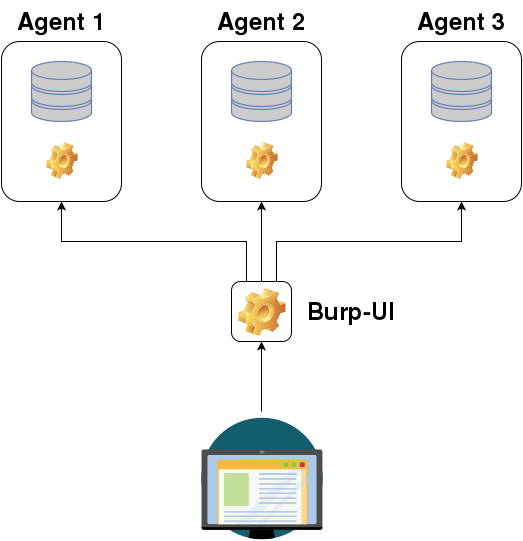 Burp-UI allows you to run several agents if you have several Burp servers and all these agents will be available through one unique UI. Every agent must implement the BUIbackend interface, but in fact an Agent is just a basic server acting between the actual backend and the UI engine. It reads the commands sent by the UI engine and pass them to the backend. This way, you can have both Burp 2 and Burp 1 servers all centralized in the same dashboard. On the other side, the UI engine also have a special backend to interact with the good agent. This backend also have to respect the interface. If we do the math, everytime I wanted to add a new feature I had to implement 4 functions: one per backend + the agent. That's a lot of work. So I decided to cleanup a bit this mess and here is the result. The special UI backend is just a proxy between the UI and the agent. There is no business code in it. The agent is also here to interact between the special remote backend and the actual local backend that to the business. The Burp 2 backend inherit the Burp 1 one because both of them share some code. So if we redo the math at this point, we see we can almost divide the efforts by 4 because in most cases, only the Burp 1 backend will carry the business code. "One instance per connection. Override handle(self) to customize action." And here comes the magic! The python abc module allows us to define abstract base classes. So I used this module to define the BUIbackend interface. Now if we want to inherit the BUIbackend abstract class, we must implement its abstract methods. Thanks to this, we know exactly what methods are implemented by any class inheriting the interface. # These functions MUST be implemented because we inherit an abstract class. # think we don't have to implement them. # Thanks to this list, we know what function are implemented by our backend. As you can see, this backend creates a NClient object per agent found in the configuration and it implements every method provided by the interface. You may also notice the code of each methods looks very similar. Again, the code of each backend method is kinda boring because we just need to encode its arguments in a json and pass them through a socket. call agents one without maintaining the explicit list of methods. """This is were the proxy call (and the magic) occurs"""
msg = "You must provide an agent name"
Now this is getting pretty convenient because every backend method is dynamically implemented thanks to the __getattribute__ method. But what if I want to overwrite a method for some reason? """A decorator indicating the method is implemented. we don't really implement it because we just act as a proxy. backend to interact with ``agents``. # needs to be "proxyfied"
Every method decorated with the implement decorator will be returned as is by the magic __getattribute__ function. The others will be dynamically generated!